For all that I complain about the subway, I like it and I don’t think I could do without it. It’s actually quite calming to sit down on the subway (if you’re lucky enough to get a seat) and just zone out and sway and get jerked around and get lulled by the rattling and screeching. 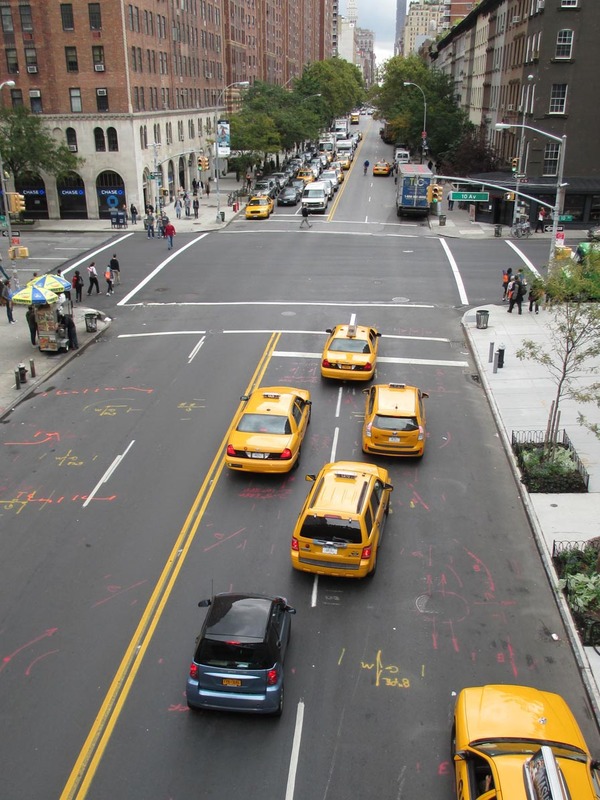 When I first moved to New York from Shanghai I felt nauseous riding the subway because of its violent shifts and loud, constant noise. But now I find it oddly soothing and comforting. But … today I spent WAY too much time underground. I also did a heck of a lot of walking across Manhattan. I crossed the park twice, walked around it once, took the 1 train (3 times), 2, N, B, 6, and S. Oh, and the N/Q/R stopped running after 10, so I had to make a detour. And due to a ‘police investigation’ (code for: suicide/death by train), the 2/3 was ‘delayed’ (code for: we have no idea when the next train is going to come) so I had to make another detour. The picture below is from back when the weather was still nice and cheery in September. It’s MUCH warmer than it was last week, but definitely pretty dreary out there. There’s been this harsh frigid wind that almost knocked me down while I was crossing the street this morning and it’s definitely unpleasant to walk around in. But hey, it’s nice and warm underground. fresh snow in the city! Last night it snowed! 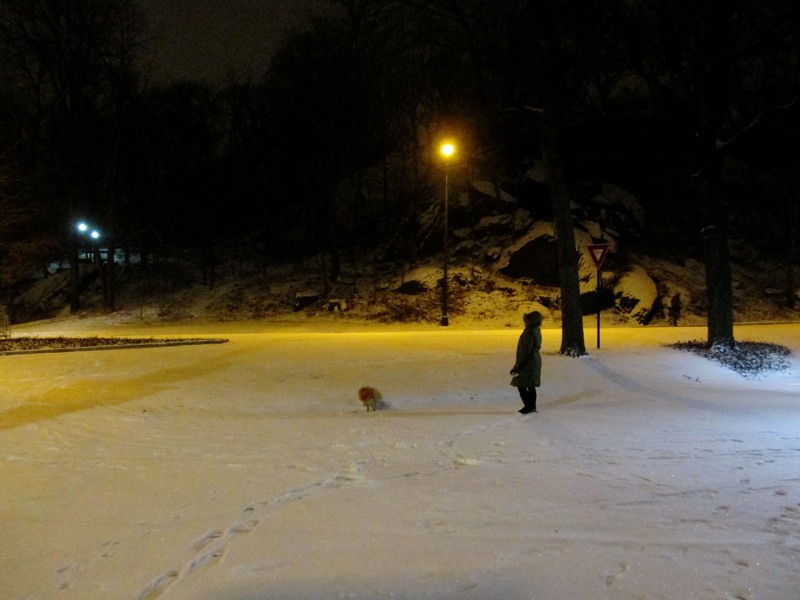 The fresh snow wasn’t all light and fluffy; it seemed a bit harsher with more crystals, which made surfaces shimmer. I hadn’t been expecting snow, and the hard soles of my cowboy boots definitely did not agree with the icy slickness of that fresh snow! I almost slipped a few times, but thankfully I never fell. It only snowed for a few hours, and by this morning most of the snow had been swept away or melted. School has once again started and everything is already starting to feel overwhelming. The weather’s cold, my schedule is in flux, and my thesis is being mean. But seeing snow fall is probably one of the most calming things ever. Sigh. Yes, I know I’m a bit late with this post. Stop harping on me already! So for those of ya’ll living under rocks, yesterday (January 21, 2013, the third Monday of January) was Martin Luther King, Jr. Day. It also happened to be Inauguration Day, and Barack Obama got sworn-in for his second term as POTUS … ya know, no big. 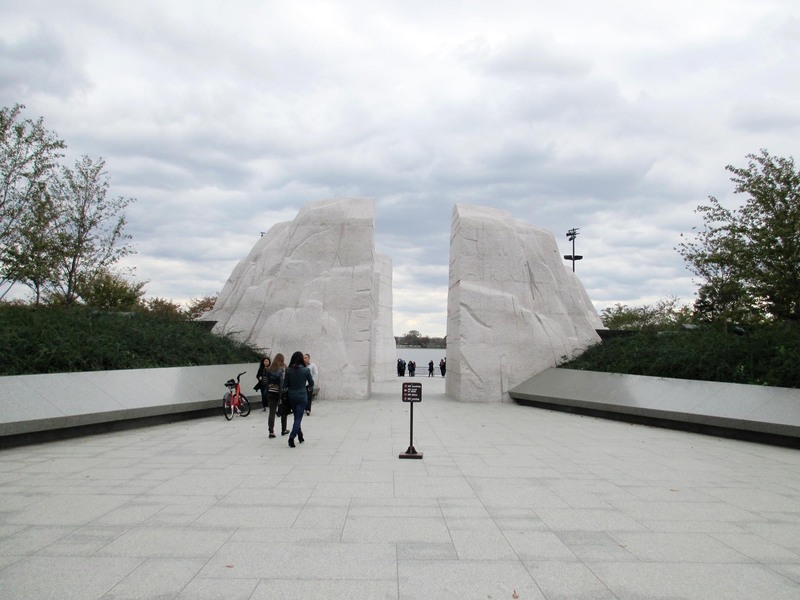 I wanted to post yesterday because the circumstances of the day would have tied in perfectly with a discussion about the Martin Luther King, Jr. Memorial in Washington, DC. But you’ll excuse my tardiness, won’t you? The memorial faced a wave of criticism when it was unveiled in 2010 and a lot of the points made were quite valid. Yesterday there was an article in “The Atlantic” that tried to defend the memorial, but … did he visit the same memorial I did? I’m not buying a lot of what he says. And the author of the article? A lawyer. Um, yeah. No offense, but I’m going to trust my eye for aesthetics and spatial concerns over yours. Personally I don’t like the memorial. I don’t hate it and I’m not going to vilify it, but I found the overall effect to be harsh and cold and alienating – not words I would normally associate with Martin Luther King, Jr. Standing at 30 feet tall, with crossed arms and a stern expression, the figure towers menacingly over visitors. 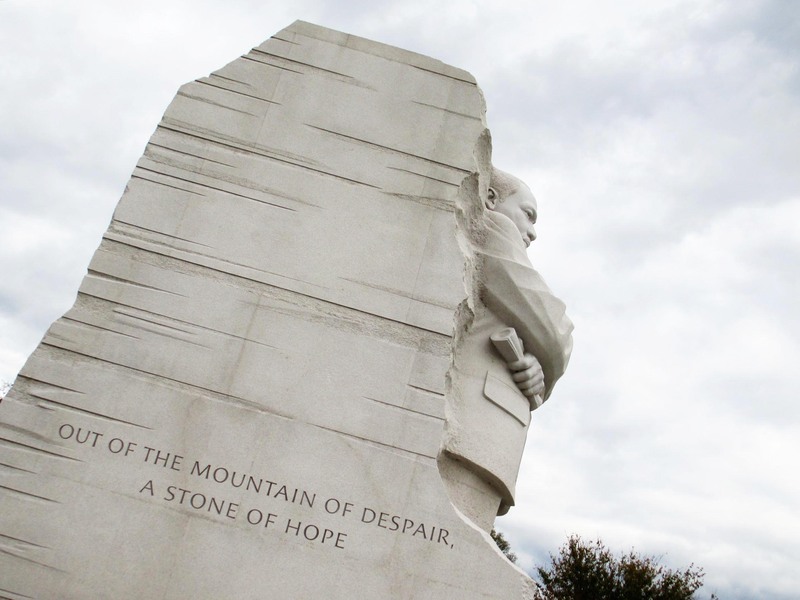 He is carved in white granite (which as a material feels inherently distant and inaccessible) and remains embedded, not fully realized, in the rock. Certainly it was meant to convey a sense of strength and immovability in the face of adversity/discrimination, but it comes across as if he is stuck but too proud or arrogant to realize his position. He has no feet, they are swallowed by the rock; he cannot stand for himself, the rock goes all the way to his head; he is not free, he is completely attached to a giant chunk of rock. And yet there he is, staring out into the Tidal Basin … all by his lonesome. My major issues with the memorial are with the space, the scale, and the sense of the man created. The memorial is set back from the road and away from many of the other memorials, to where you need a sense of what you are looking for and where it is or you’ll overlook it. There’s a weird empty plaza which funnels you through a gap, at which point you see the gigantic chunk of white granite (that was seemingly pushed from that gap), and then only after you finally walk all around that chunk and crane your neck upwards do you see the figure of King, who stares at the water as if annoyed he’s staring at water with his back (er … his chunk-rock-back) to the entrance. Basically, the amount of empty space is too much, the figure of King is too large, and the presence of rock is too heavy. There were other issues, such as an oddly-edited quote inscribed on the memorial (the one seen in the image directly above), but since that’s being fixed, I’ll leave it be. There was also the shoddiness of choosing a Chinese sculptor instead of an American for the representation of such an important American figure, but that’s politics/economics for you. 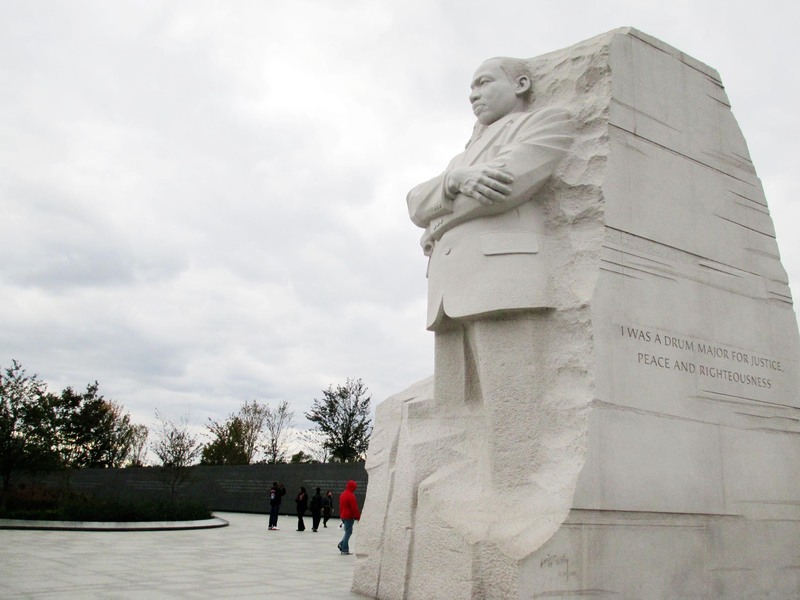 I appreciate that the memorial has King boldly standing in the open as opposed to being protected in a little house like Jefferson or Lincoln, and I appreciate that there at least is a memorial to Martin Luther King, Jr. in DC. And maybe all that space won’t seem so useless when it’s filled with crowds of summertime tourists, and maybe the stone won’t seem so harsh when there is warm sunlight bounding down, and maybe the figure of King won’t seem so stern when you’re not freezing because it’s cold outside and there’s a cold breeze coming off the Tidal Basin. But I doubt it. In the end it was a poorly executed memorial for a great, important man in US history. It’s a shame. And on the subject of fast food in airports (the subject of my last post), here comes KFC! In the Mumbai airport! It’s the chicken zinger sandwich from KFC, which I ate at the Chhatrapati Shivaji International Airport (BOM) in Mumbai, as my last meal in India. 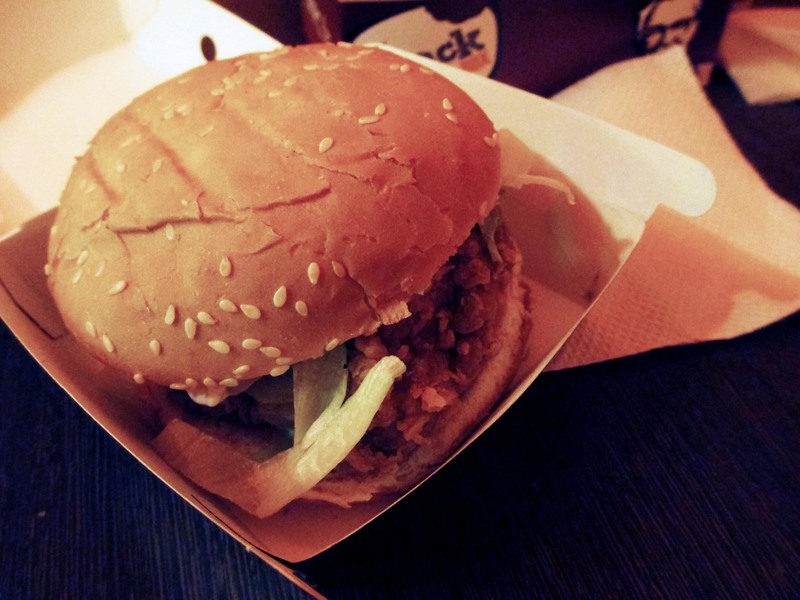 Is it weird to eat American fast food in a foreign country? Yeah. But since the chicken zinger isn’t sold in the US, it’s totally fine. Basically it’s a spicy crispy chicken sandwich. Not all that special and not all that great. The bread kept falling apart and the mayonnaise was too sweet, but the chicken was good although not as spicy as I expected/hoped. I remember the spicy chicken sandwich from a McDonald’s in India being much better, but that was roughly two years ago so I can’t say for sure. Anyhow, it was a decent way to end the trip … there’s only so much curry and kebabs I could take. I’m not a good cook. I boiled my first egg in my junior year of college … after asking my roommate how to hard-boil an egg. Seriously. I’m not even kidding. My mother is a fabulous cook, but maybe when I was little I burned myself one too many times on the stove, because I don’t like that thing! The oven, however, is my friend. One of the things I make way more than I oughta is potato wedges. Why? 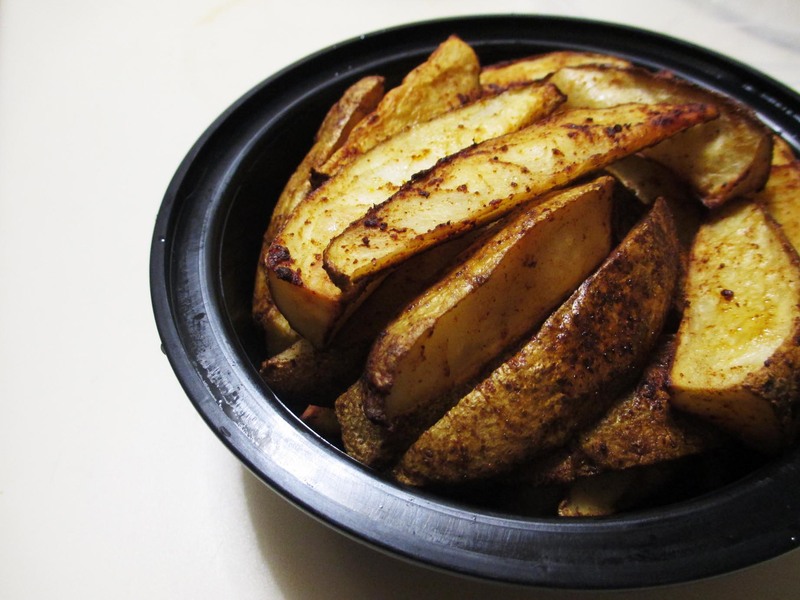 Because potatoes are cheap, I’ve never been one to turn down starchy goodness, and potato wedges are easy to make and easy to eat. It’s pretty forgiving so it’s impossible to make them wrong unless you leave them in the oven for hours and burn them to a crisp. Sometimes I use red potatoes and sometimes I use baking potatoes … whatever I happen to have or whatever’s on sale at the grocery store. Scrub the potatoes clean, slice them into wedges, and pour on chili powder, paprika, garlic powder, salt, pepper, and/or whatever else. Then pour in some vegetable oil and mix it all so that every wedge is coated with enough seasoning and oil. When you think it’s good enough, line them up on a baking sheet and stick them in the oven at 350F (or thereabouts) and let them bake for an hour (or thereabouts). Potato wedges don’t take much preparation or thought. They are, in a word, ideal. Arby’s! Roast beef! Arby’s sauce! Yum! There is no Arby’s near where I lived in Houston, there is no Arby’s in China, and there is no Arby’s in Manhattan. So basically what I am saying is that I had not had Arby’s since undergraduate … and college was quite a while ago. But I like Arby’s! When I had a layover at the Baltimore (BWI) airport (my first time at that airport), I saw that they had an Arby’s and I got so excited! Classic roast beef sandwich, please! 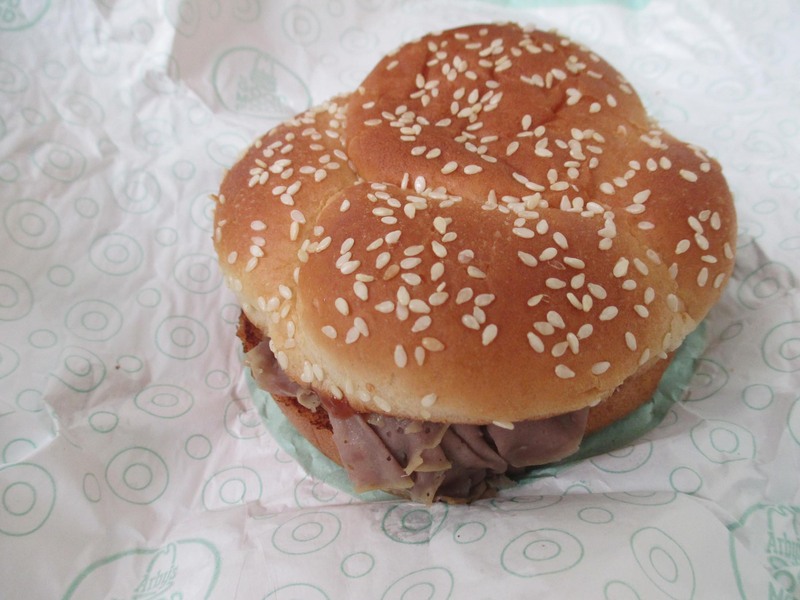 Back when I was younger I used to be somewhat OCD so I would have to rearrange the roast beef so that it was level (because usually when then stick it on the bun it’s kind of in a big clump) and spread the sauce on evenly so every bite was the same. This time, I squeezed two packets of sauce onto the thing and gulped it down. Verdict: SO YUMMY. Alrighty, peeps. This is my last Houston post. Mostly because, well … I’m not in Houston anymore! And it’ll probably be a while before I return again to the land of sun and Tex-Mex. This series of “Back in H-Town” posts have all dealt with Houston art museums and architecture associated with them in the downtown area. So I’m going to end with one of my “favorite” works of architecture in Houston. Quotations are needed, because there’s so much wrong with this thing, but that in turn makes it fascinating. This monstrosity, ladies and gentlemen, is the Chapel of St. Basil. I visited shortly before the new year, so they still had their Christmas decorations up. 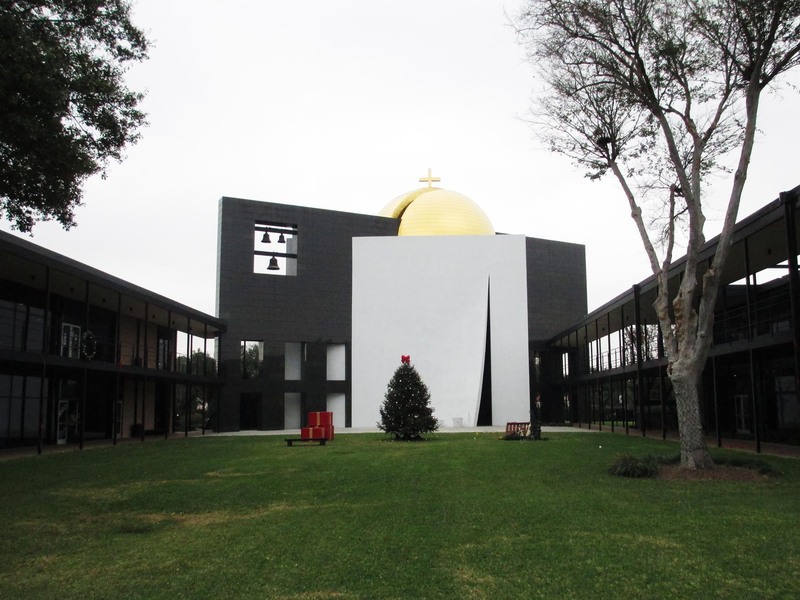 It is located on the University of St. Thomas (UST) campus – a stone’s throw from the Menil and Rothko Chapel – and was designed by American architect Philip Johnson (also architect of the Rothko Chapel). Johnson designed the university’s Academic Mall, the long two-story arcades on either side of the chapel, way back in the 1950s (on recommendation of the Menils) … but back then he was relatively unknown and his chapel design was rejected … so this chapel wasn’t completed until 1997, after Johnson had become super famous and was really old. In other words, this was one of Johnson’s last buildings, was after his high modernism phase, and came at a time when he was probably having a lark and could do whatever he wanted because people would still worship him. Basically there are three elements: the white stucco cube (with the entrance flap), the gold-leafed sphere (actually a semi-sphere dome), and the black granite plane (that doubles as the bell tower), and the intersection of these three perfect forms (cube, sphere, plane) form the chapel. I actually wrote a paper on the chapel in my senior year of college for an architectural criticism course. The entrance sequence, internal layout, natural lighting system, and exterior form are actually quite intriguing. I guess those are things I find similar with the Rothko Chapel, with Johnson playing around with the archetype of a chapel. However, since the Chapel of St. 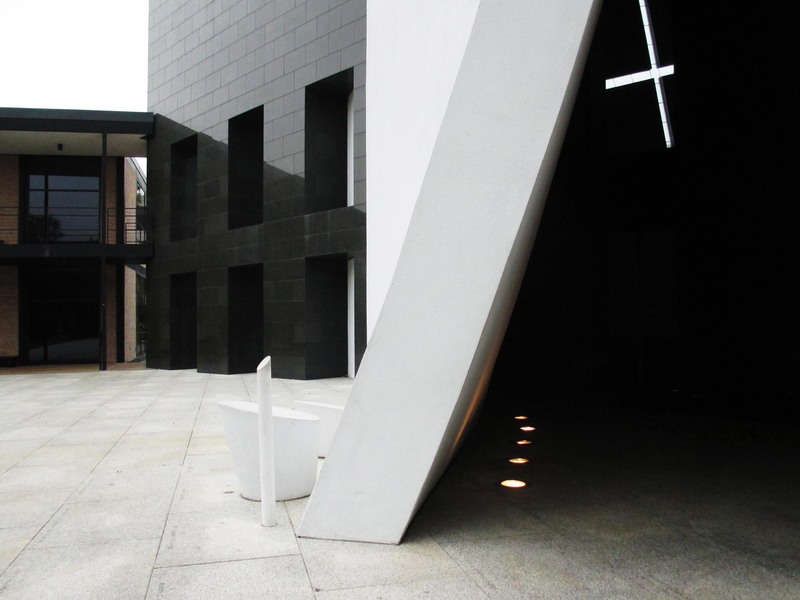 Basil holds services, its program and elements are more typical than the Rothko Chapel, so inside there are pews, religious statuary, an altar, et cetera. 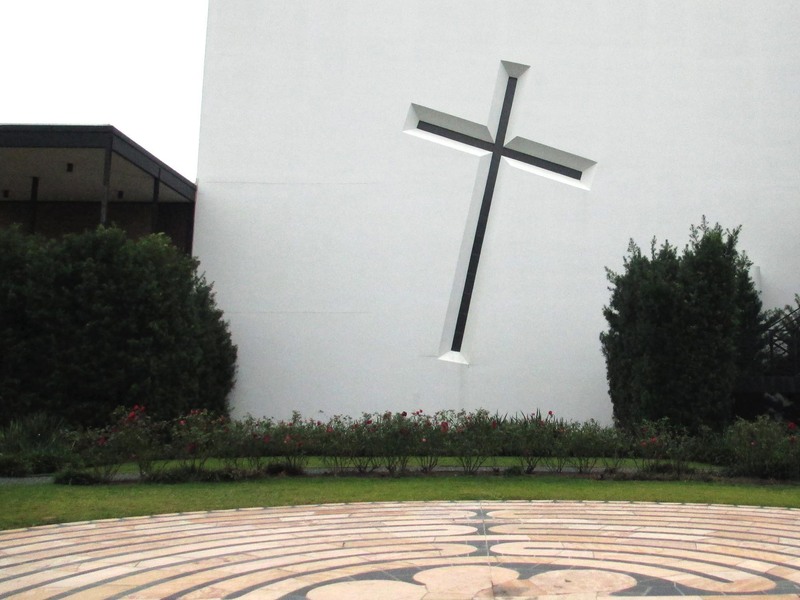 But … in the picture above, do you see the giant tilted cross? Yeah … there’s a giant tilted cross in the side of the cube that’s only viewable from the prayer garden and the street beyond. The official explanation is that it represents the tilt of Jesus carrying the cross, but it seems heretical and reminiscent of the Russian suprematists. Also given that Philip Johnson was gay and not Catholic, but here he was designing a chapel for a private Catholic university … it makes you wonder if he had a smirk on his face as he sketched and why the university let him run wild. UST’s new logo actually incorporates the chapel in its design and they’ve fully embraced this piece of architecture. And yet … it’s atrocious. But immensely fascinating. 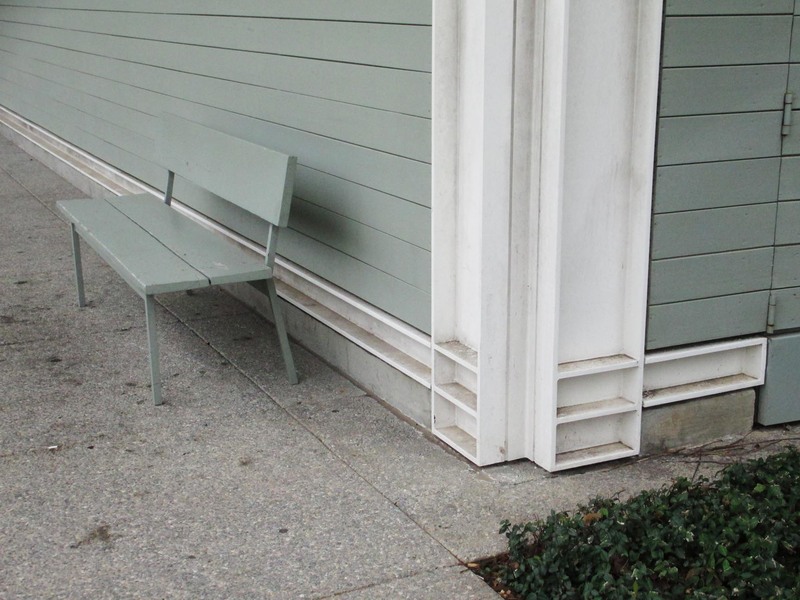 Last week I posted about the Menil Collection, so of course I now need to talk about the little Rothko Chapel as well! It’s a block away from the Menil and was commissioned by the same Dominique and John de Menil, but the last time I visited it was probably around 10 years ago. While the Rothko Chapel is technically a chapel … it doesn’t really feel/seem like a chapel other than the atmosphere inside. It’s actually more of a mini gallery of Mark Rothko’s paintings. 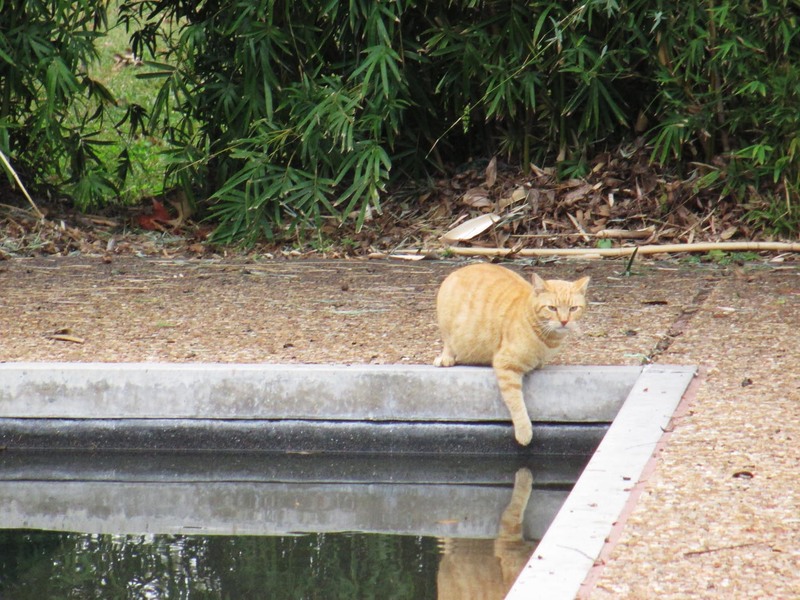 Er … this cat is not the Rothko Chapel. But he (or she?) was hanging out in front of it, so I just had to take a photo. But hmm … it doesn’t look very happy at having its picture taken. The Rothko Chapel itself is a bit … odd. Okay, very odd. It’s modern architecture (courtesy of American architect Philip Johnson), so whatever. The exterior is brick and the main interior is an octagonal space with 14 large black paintings (that aren’t completely solid black, but still essentially black) on the walls and some benches. Its skylight is baffled, probably because they realized light was bad for the paintings and the dimness of the space now is kinda nice. At the Menil, there are a few Mark Rothko paintings that are essentially extras for the Rothko Chapel. That was pretty interesting. In the Rothko Chapel, the large format of the paintings and the darkness of their hues, organized around the perimeter of the very regular and dim space, created a heavy, serene environment that felt safe to be in. But in addition to the front desk/receptionist guy, there were two people monitoring the main space, and for a such a small space it seemed overkill. When I entered, there was one woman sitting quietly on a bench, but a group of tourists (with a baby!) entered shortly after, and they were not in there for silent contemplation. I know museum guards and watchful volunteers are necessary to prevent vandalism, which is an unfortunate statement on today’s society … but it’s hard to appreciate a space when it’s made to feel like a prison with someone always watching you. And it’s great that more people going out and appreciating art and architecture … but it’s annoying when they don’t offer the deserved respect. If I could have the Rothko Chapel to myself, now that would be nice. But as it is and despite my love of chapels and churches and cathedrals, I doubt I’ll be visiting it again any time soon … unless I’m bored. Then, maybe. 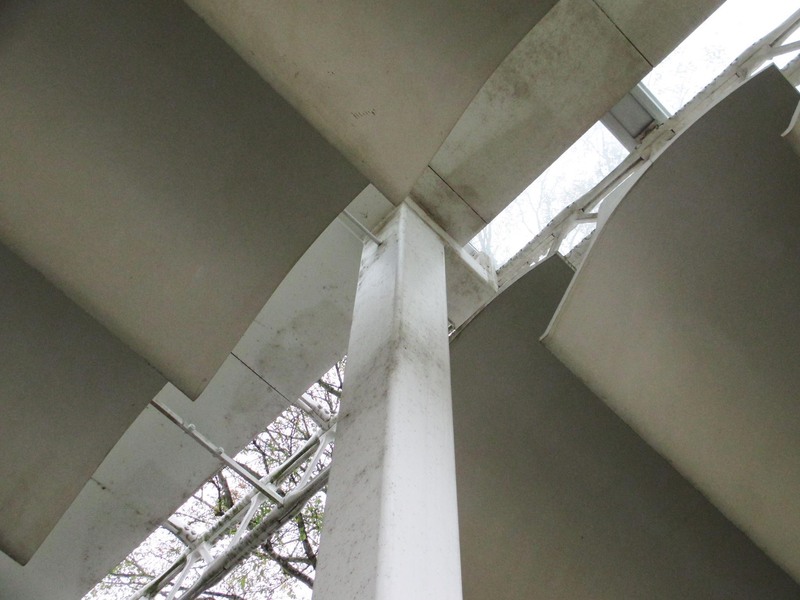 The Menil Collection is a short drive away from the MFAH and CAMH in downtown Houston. It has its own parking lot (yay!) and is free admission (yay! ), but it’s only open Wednesday through Sunday, which are kind of odd hours. I know the museum more for the architecture than the art, and more for its history than its current events. The Menil Collection is a museum housing the private collection of John and Dominique de Menil and was opened to the public in 1987. Basically, the Menils were loaded, very much a part of the art scene, and contributed a lot to Houston in terms of the arts and architecture. They were also patrons to Philip Johnson, who went on to help define modern architecture. 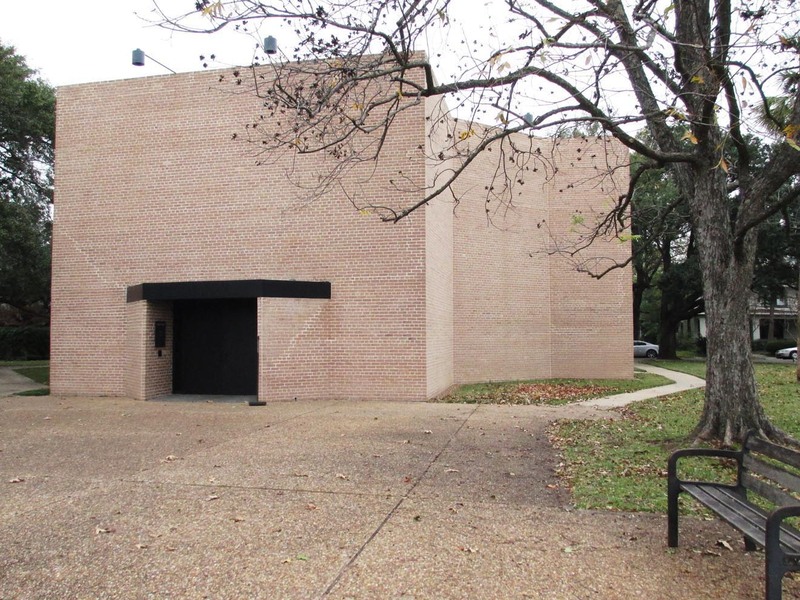 The Menil Collection is located in a fairly residential area, near the University of St. Thomas, and it fits its surroundings. It’s a pretty simple rectangular structure with wood siding painted gray, a low profile, and a surrounding portico. You enter in the middle and go either left or right to the galleries. The collection itself is kind of odd, split between twentieth century and contemporary works on the right and antiquities and African stuff on the left. The three exhibits going on right now are “Progress of Love” (weird contemporary stuff, some of which is downright pornographic), “Claes Oldenburg: Strange Eggs” (eh), and “Dear John & Dominique: Letters and Drawings from the Menil Archives” (kinda interesting if you’re interested in the museum itself or art scene and don’t mind reading, but not much to look at). As a side note, there seem to be a whole lot of museum guards for the relatively small museum (smaller than the MFAH but larger than the CAMH) – and they’re strict! I didn’t get yelled at, but there were a lot of other people that got evil eyes and strongly worded “No photos” or “Stop that.” Then again, a Picasso got vandalized last June at the Menil, so I can imagine they’re being vigilant to avoid a repeat of that incident. Or maybe it was because I was there when it first opened for the day and the guards were still in a morning grouch. The architecture is a classic. 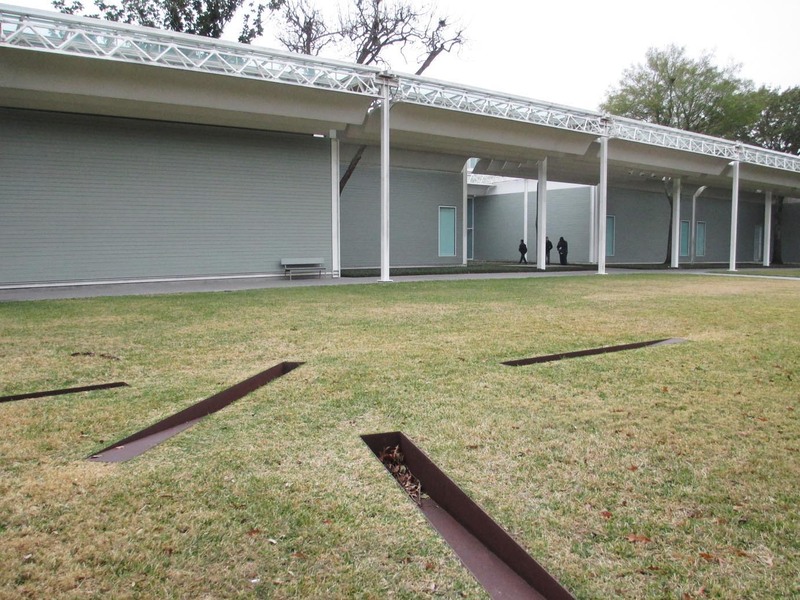 Not sure how many people know of the Menil, but we studied it in architecture school, which could be because I went to school in Texas … where we studied a lot of Texas buildings. But it was designed by the Italian architect Renzo Piano, and that dude’s internationally famous. And for good reason. 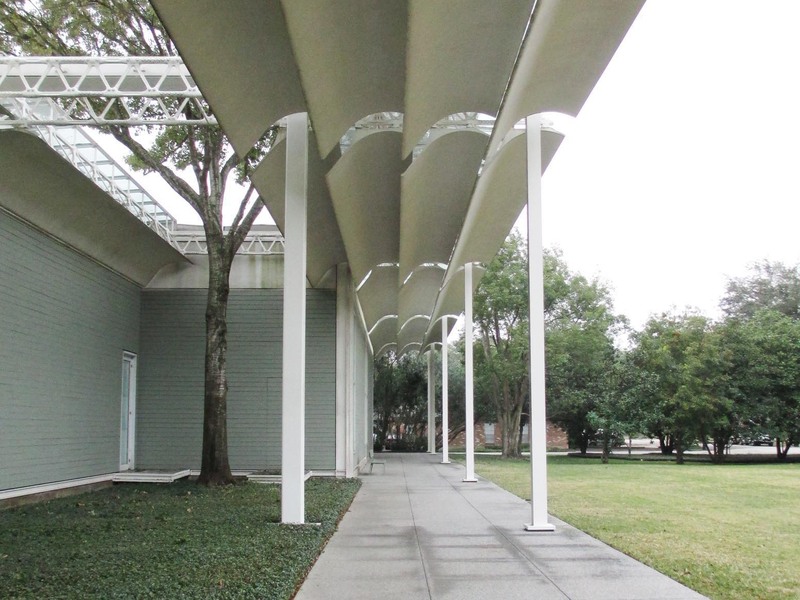 The Menil Collection is mostly known for its louvered ceiling, which bounces light into the museum space, since natural light generally looks great but the ultraviolet rays from direct sunlight can damage artwork. In some of the gallery spaces the ceiling is completely covered to further protect the work from light, which is understandable but unfortunate. But the exterior, where the louvers are exposed … well that could use a real good scrub down. Ah, so last week I posted about the MFAH, which I often visited this past summer during my lunch breaks. If you go to Cafe Express (the MFAH’s cafe) or the food truck parked in the MFAH parking lot, you get free admission to the MFAH if you go at lunchtime. So … me and the other interns went a number of times. Anyhow, I used to intern at the Contemporary Arts Museum Houston (CAMH), so I had to stop by to check out its new exhibits. It’s much smaller than the MFAH and it’s a non-collecting museum, so there’s no permanent collection like the MFAH has. First up, the CAMH got a statue! Of Andy Warhol! “The Andy Monument” by Rob Pruitt was apparently on display in New York’s Union Square for a while, but seeing as I still have not been to Union Square, I never saw it there. 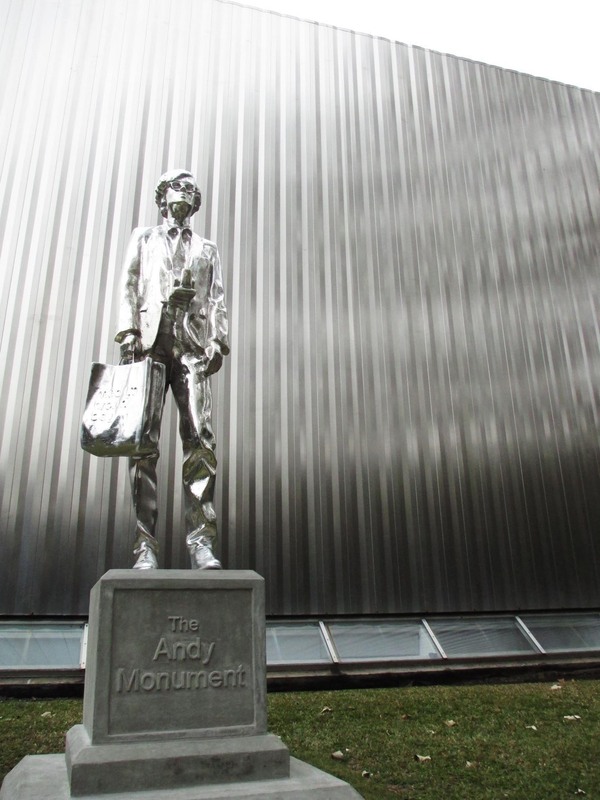 And hey, Andy looks like he totally belongs at the CAMH since his shiny chrome surface matches the CAMH’s shiny corrugated steel exterior. 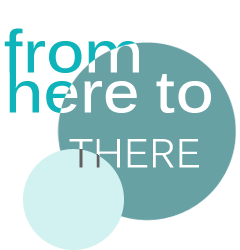 The CAMH has two floors – the ground floor and a basement level – so there are always two exhibits going on at the same time. On the ground floor there’s “Radical Presence: Black Performance in Contemporary Art” and downstairs the exhibit is “Unfinished Country: New Video from China,” both of which will run until mid-February 2013. The upstairs exhibit was a bit random and confusing because I wasn’t there for one of the scheduled performances, and the performative aspect is lost when only artifacts are shown. It’s an interesting topic, but I felt like there was information lacking, like the exhibit was evidence for a research paper rather than a stand-alone kinda deal. Downstairs I sat and watched some of those videos, but honestly not for very long. Found it kind of lacking. I like the CAMH, I really do. I have fond memories of my few months working there, but … I’m not a big fan of the exhibits. It’s a small museum (really small), it doesn’t have the resources that larger museums do, and the members of its tiny staff take on multiple roles. But the CAMH isn’t about catering to the public or showing famous pieces of art. 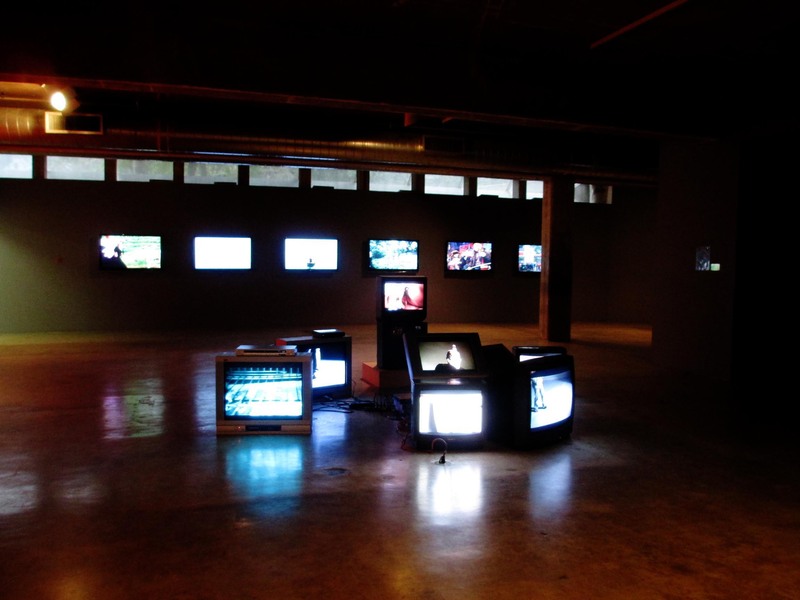 It’s about contemporary art – what’s happening in the art world out there right now – whether you like it or not. Plus, it doesn’t charge admission and it’s motto is “Always Fresh, Always Free.” I can appreciate that.